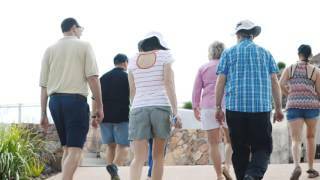 Tour Townsville has developed an extensive range of regular and custom tours that operate both day and night. Their day tours specialise in telling the story of Townsville and viewing its best scenic sights. They have military history tours of Townsville and others that cover its general history. Their scenic tours take you to their most iconic sights and set you up for a great stay in their wonderful city. Hear stories of the city’s 150 year history and discover the plans that continue to see Townsville North Queensland evolve into one of the largest and most dynamic regional cites in Australia. Their night tour indulges you in wonderful night out, by admiring the work of a local artist at one of Townsville’s boutique art galleries, before taking in the spectacular scenery of Townsville by twilight as you dine at a private venue overlooking the water. After admiring Castle Hill from the water’s edge the evening will conclude at the very top of the Hill where you’ll enjoy the breathtaking view of the sparkling lights of Townsville’s vibrant city. Their city has a story to tell. The tour stops at a number of locations across the city, includes a beautiful morning tea at the Tumbetin Tea rooms in the Botanical gardens known as the Palmetum. Military history tour plus Scenic tour, includes a free upgrade to lunch. They also offer a Scenic tour which covers the cities general history and takes in the best of the city's iconic sights. This tour can be selected as an add-on option. When combined with their military tour as detailed above it creates a comprehensive full day of entertainment. Adds an additional 2.5 hours to the return time detailed above. A trip to the top of Castle Hill will provide spectacular views over the tropical city and across the Coral Sea to beautiful Magnetic Island. It will help you orientate yourself for the rest of your visit to this vibrant city. This tour is a stand alone tour but is available as an add on option to the military tours or city lights tour. Discover those hidden secrets of Townsville that most visitors never get to see. View the university and regional hospital, enjoy a walk around the River way precinct and hear stories about the early explorers of the region. Enjoy your morning tea at the Heritage Tea rooms, the oldest building of its type in North Queensland and experience the views from Thornton’s gap at the top of the mountain range. This tour takes you away from the city to experience the river area and up into the mountains above Townsville. Learn how those early pioneering years and events, laid the foundation for Townsville to become the largest city in northern Australia.